Explanation: Barringer Meteorite Crater, near Winslow, Arizona, is one of the best known impact craters on planet Earth. 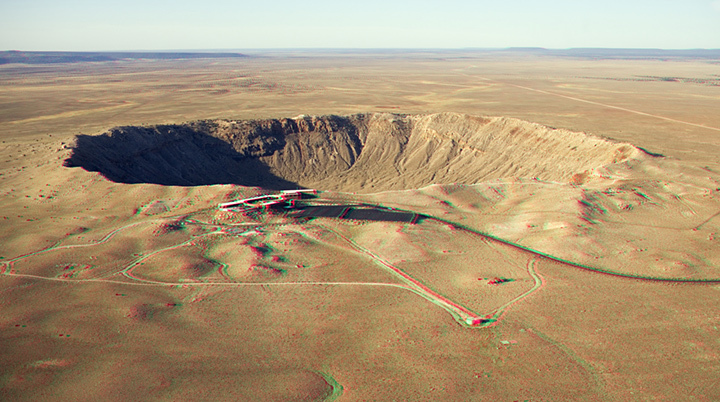 View this color stereo anaglyph with red/blue glasses to get a dramatic sense of the crater's dimensions -- one mile wide, and up to 570 feet deep. (A cross-eyed stereo pair is available here.) Historically, this crater is the first recognized to be caused by an impact rather than a volcanic eruption. Modern research indicates that the impactor responsible, a 300,000 ton nickel-iron meteor, struck some 50,000 years ago. Estimates suggest that it was about 130 feet across and was traveling over 26,000 miles per hour. For comparison, the asteroid or comet impactor that created the Chicxulub crater 65 million years ago, and is thought to have caused the extinction of the dinosaurs, was 6 to 12 miles across.